I wouldn't have gathered that it was before Equestria's founding. Plus that canon wouldn't really fit show canon. since Equestria was never heard of until the founding. thats why it was the founding. plus confusing the kingdom equestria with the world equestria really screws up readers. As such you need to differentiate. To put in crisp I would word it like so. why do sundays always have to the day when things close early? why do things have to ever close early? beautiful princess who ruled over a kingdom called the Dream Valley. All lived for their purpose and everything was in harmony. world upside down all for the sake of its own amusement. Under the rule of chaos, Dream Valley began to fall into ruin. The ponies' purposes were twisted and broken with the world around them. And their beloved princess fell and fled. The peaceful princess one day returned to take a stand against the chaos that was tearing her world apart. army of ponies of all races against the chaos. her efforts, the princess and her subjects were powerless. They were tortured and toyed with, sparing only the princess so that she could watch. She begged the chaos to turn away, she prayed for harmony to return. fyi-the sudden switch to world scale to small scale really throws me off. but meh. heard of until the founding. thats why it was the founding. peace briefly following the settling of Equestria. In my opinion, without the "in the magical land of Equestria" it loses the whole MLP factor and breaks the flow of the narrative. When I write, it's for the flow, which is most important. Sometimes I get it right and sometimes I don't but that's the goal. The same goes for the point "who ruled over a kingdom called the Dream Valley." When I read it, it has a clunky feel which is hard to explain... Again, also it now has the Pony element cut out. I do like the second part though. ponies' purposes were twisted and broken with the world around them. This part I don't agree with as it paints the princess to have been cowardly, however she truly stood her ground and tried to keep her kingdom going as if nothing was wrong. An ignorant and foolish thing to do but a noble one considering her kingdom was a peaceful one. Ah, this is a point I considered while writing, but during the intro of MLP:FIM, no names were revealed and since I was basing it specifically on the show's introduction, I didn't want to mess with the tried and tested formula. Quote: why do sundays always have to the day when things close early? why do things have to ever close early? Drives me insane too. >_< Something to do with Celestia stopping for a day to eat cake and drink tea I think. well my short reply is "whatever"
a slightly longer reply is. loyalty is only good when it is done to augment your own story. and your story is seriously not being loyal to mlp mythology. As such, why bother trying to be like the show? the "flow" of yours has exposition syndrome (I'll explain later). Okay so Celestia and the Equestrian military didn't help this kingdom within a kingdom? (stupid enough that a city was a freakin empire) And at the time Luna and Celestia were allies, a time when Equestria was possibly at its most tranquil and powerful. If its going to be some throw away red herring, like the princess was celestia then you've just broadcast it by pointing out that major plothole. If its not celestia then you have yourself a plothole. Because by anyone's headcanon, celestia would defend Equestria in that era, since she said she did in the show. Cowardly princess? Your princess just told a whole kingdom in peril to just watch as chaos reigns. Which would you want? A princess that fought lost and fled in fear or a princess with no emotion at all and just went. Yeah just wait it out, everything will solve itself. You were trying to portray her a utopian ruler. A utopian ruler, doesn't act like a tool. In fact here my recommendation. She lost and fled never to be seen again. Ponies united and fought back but lost. Celestia and Luna came to rid it of chaos. But they rejected celestia as their ruler. Hoping that someday their princess will return. and give them purpose again. When your narrative is so full of padding that it actually slows the progress of the plot, you know you need to rework things or put things aside for later. As you can read about 30% of what you originally said could be skipped and you still get the original message. so my final say is whatever. I have a feeling you're the kinda newbie writer that won't realise these elements in narration until you grow as a writer with age. Princess who founded cutie marks and the cmc are interested=good. rest needs you to start from scratch. RD just randomly shoving herself in as a main character? No. RD needs to be more personally invested beyond "going in an epic adventure to do a favour for some kids." (11-19-2012, 02:32 AM)Ceresbane Wrote: well my short reply is "whatever"
and your story is seriously not being loyal to mlp mythology. As such, why bother trying to be like the show? the "flow" of yours has exposition syndrome. When your narrative is so full of padding that it actually slows the progress of the plot. As you can read about 30% of what you originally said could be skipped and you still get the original message. Just to make it clear, I wasn't dismissing your critique at all. From what we have seen, there were plenty of "kingdoms", "princessdoms" or whatever you want to call them, just prior and maybe even just after Celestia and Luna came to power. 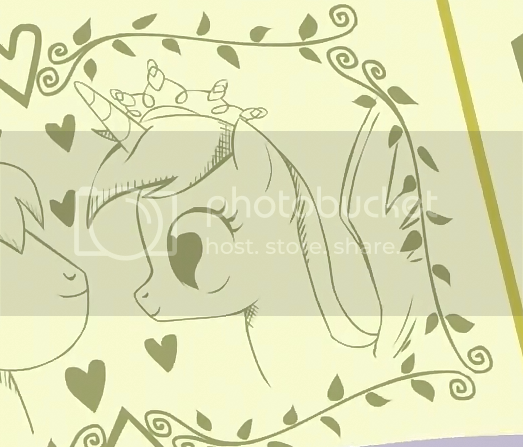 Evidence for this can be seen in the first episodes of season 3 with the Crystal Empire, as well as in the CMC episode, Hearts and Hooves Day. For the latter, the book Twilight lent the Cutiemark Crusaders clearly depicts the Princess of the Love Poison story as a winged Unicorn Pony, an Alicorn in other words. This, as well as all Princesses shown in the show being Alicorns, adds up that Princess Ponies are in fact all, or mostly, Alicorns. We now see that Alicorn Princesses were at least the norm in Equestria, with the Crystal Princess presumably being an Alicorn as the flying Cadence was mistaken for her. We also know that Celestia and Luna did not always rule Equestria, even after it had been founded, as laid out in the episode "Hearth's Warming Eve". We also know that Discord ruled Equestria before Celestia and Luna were able to encase him in stone. With Discord on the "throne", one can only imagine how much damage he could have inflicted on Equestria, how many kingdoms fell because of him. Alicorns seem rare in modern Equestria and it is easy to theorize that Discord saw them as challenges to his power. Unless the show deems otherwise, I see no reason for it not being loyal to MLP:FIM mythology. In fact so far it seems to fit perfectly, in the sense that it is plausible and can be added and removed without any damage to the canon. On the writing side, writing is my dream. I do my best, but as I said, I don't always get it right. I didn't mean to sound as if I was discarding your opinion, I was just adding my own in the hopes of further feedback and deeper explanation. possibly at its most tranquil and powerful. It is most likely that Celestia and Luna were not major powers at the time, otherwise Discord would not have been able to RULE Equestria. went. Yeah just wait it out, everything will solve itself. I liken her to an imperfect Gandhi, she wants to believe that peace can be achieved through non-violence and manages to keep conditions from degrading as fast as they would have otherwise, but there was only so much she could do before being forced into war. She made a choice that, in hindsight, was best for her subjects. Chose the lesser evil so to say, untill having to make the other choice and failing. beyond "going in an epic adventure to do a favour for some kids." could be skipped and you still get the original message. Quote: You were trying to portray her a utopian ruler. A utopian ruler, doesn't act like a tool. She could make everyone feel needed and happy, close to Utopian but they're still under the rule of a being with flaws having to face a being which uses flaws to its gain. I can argue further but I wont. I will simply say good luck with your project and hope other people like me will point out the plot issues of your project so that you can grow as a writer. On the otherhand, if you make a decent game. You can make the worst plot in the world and it wouldn't matter a wit. Added some more to the opening post, reaching to the end of the first level of the game. This is just a rough draft so feel free to comment and critique.